Properties in Destin on the Gulf average 4.3 out of 5 stars. The newly renovated condo sits on the gulf with a magnificent view. Property 2: The newly renovated condo sits on the gulf with a magnificent view. 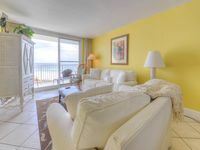 This is a beautiful remodeled beach front condo with a great view of the gulf. Property 3: This is a beautiful remodeled beach front condo with a great view of the gulf. Family Delight! Destin on the Gulf #502, offering Gulf front views! Property 7: Family Delight! 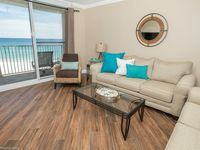 Destin on the Gulf #502, offering Gulf front views! Directly on the beach, 7th floor, best views! Property 13: Directly on the beach, 7th floor, best views! The only complaint I have really is our couches was soaking/dripping wet from where it was cleaned so we couldn&rsquo;t sit on them till the next morning after arrival when they dried out. The beds was a little hard but overall we had a great time. I would recommend this condo to anyone!! Nice condo, we enjoyed our stay. Something to consider, we booked 3 for nights for 7 people, but only provided 2 trash bags and 4 toilet rolls. Will be nice if provided tide pods for laundry. Other than that, the location is right by the beach, very convenient!